Everyone has dreamed of that perfect romantic vacation, honeymoon, or getaway—warm tropical breezes, beautiful sunsets, exquisite dining, luxurious accommodations—alone with your spouse. Whether your dream includes an oceanfront cottage with strolls and picnics on the beach, or a luxurious penthouse, fine dining and dancing in the moonlight, you're sure to be inspired by these ideas. Romantic settings don't get any better than this! You can turn back the pages of history, to the time of horse-drawn carriages and southern hospitality at its best, in St. Augustine. A wide array of romantic bayside bed and breakfast inns such as the Westcott House or the Cedar House Inn provide an atmosphere of romance and days gone by. By day, stroll St. George Street's timeless shopping area. Enjoy fine dining at the infamous Columbia Restaurant, and take a moonlit horse-drawn carriage ride past historical landmarks and the sparkling water of the bay. Balmy breezes, white powdery sand, and year-round sunshine make Florida's beaches the most sought-after vacation destinations. Whether you seek a secluded spot for a weekend getaway or a beautiful backdrop for a romantic weekend or honeymoon, it's unforgettable. One of the most romantic vacation destinations for the beach is Southwest Florida's Fort Myers & Sanibel. In fact, it even boasts the state's most romantic park, Lovers Key, overlooking the Gulf of Mexico; and, Captiva Island has been ranked as one of the country's most romantic beaches by Dr. Beach, Stephen Leatherman, Ph.D., recognized as the nation's foremost beach authority. 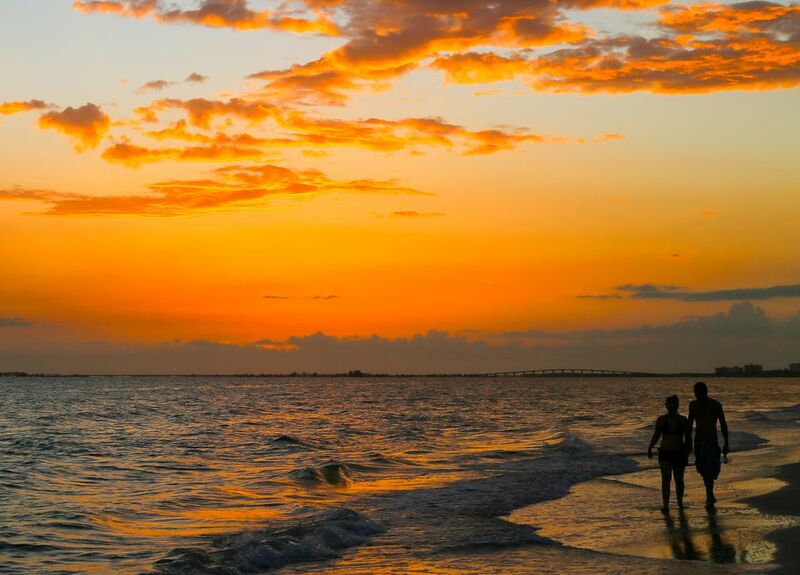 Spectacular sunsets are always free along Florida's Lee Island Coast—which also includes Sanibel Island, Bonita Springs, Estero Island, and Fort Myers Beach—boasts miles of unspoiled beaches for watching them. There you will find many opportunities for quiet romantic walks, shelling, or water sports such as parasailing and jet-skiing. In addition to an abundance of natural beauty and recreational opportunities, there is an endless array of world-class resorts, restaurants, services, and facilities that cater to lovers of all ages. Disney is hardly secluded, but it can be romantic—it is simply up to the accommodations you choose. My choices would be Disney's Grand Floridian Resort & Spa or Wilderness Lodge. The Grand Floridian has the Victorian opulence and pampering service of a bygone era, while the Wilderness Lodge is reminiscent of the park lodges of America's Great Northwest. Both offer a variety of activity and dining experiences—enough that you'll never have to leave the resort unless you want to. At least once in your life, you ought to do something outrageously romantic—something you'll both remember for the rest of your lives. The luxurious accommodations and gourmet dining are expensive, but for those who want to splurge, the oceanfront Ritz-Carlton in South Beach is the place. The understated elegance of the property is the perfect romantic setting for a special getaway. Elegant appointments and beautiful Atlantic views are not the only amenities. A fully equipped fitness center, a spa, elevated swimming pool, and jacuzzi lend enough activities to please even the fussiest spouse... err, guest. Florida has an abundance of wonderful spas and spa/resorts—many are quite affordable and some are just as romantic. You'll be wishing upon your lucky stars as you and your sweetheart enjoy an evening of dinner and dancing aboard the Starlite Majesty Dining Yacht. Elegant decor, fine dining, first-rate musicians, and an ever-changing water view on smooth inland waters, all combine to make a truly memorable night. Are You High-Society Enough for Eau Palm Beach Resort?